If you’re anything like me you’d much rather spend time in the kitchen cooking and eating, than doing the dishes! This has meant that, over time, I have become a bit of a ‘one-tray’ queen, and in turn I have truly mastered the art of leaving the smallest footprint in terms of dirty pots and pans. 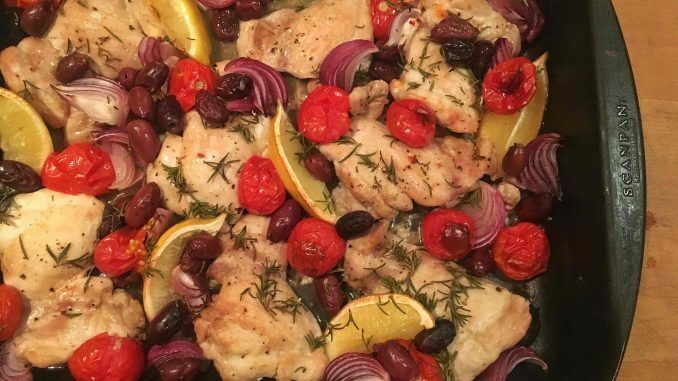 The best thing about this Mediterranean inspired one-tray bake is that it’s quick, packed full of flavour, and creates its own sweet, zesty sauce with the combination of the blistered tomatoes, the lemony juices and the sweet caramelised onions. In fact, the lemon wedges become so mouth-wateringly sweet when roasted that I like to pair a bit of their juicy flesh with every delicious mouthful. And the second-best thing? There’s only one tray to wash up! Preheat the oven to 200°C. Panfry the chicken thighs in a little olive oil until browned, season well, and add to the baking tray. Cut the onion and the lemon into wedges and pop into the tray around the chicken thighs. Scatter the cherry tomatoes over the top, drizzle with olive oil, and season well with salt and pepper. Roast in the oven for 20 to 25 minutes, or until the chicken is cooked through, adding the Kalamata olives and rosemary leaves about halfway through the cooking time. Divide up the chicken tray-bake, and serve with crispy greens and crusty bread.